Stomp contributor Joyce boarded the unique Grab car on Saturday (Jan 12), at around 9.45 am. She and her three children were going from Novena Square to the Whampoa area. Joyce described her memorable GrabCar experience: “My kids were curious about why there were so many ‘cables’ on the car’s headliner. “The driver, Mr Clarence, replied that he did it as a Christmas decoration and turned on the fairy lights to show us. 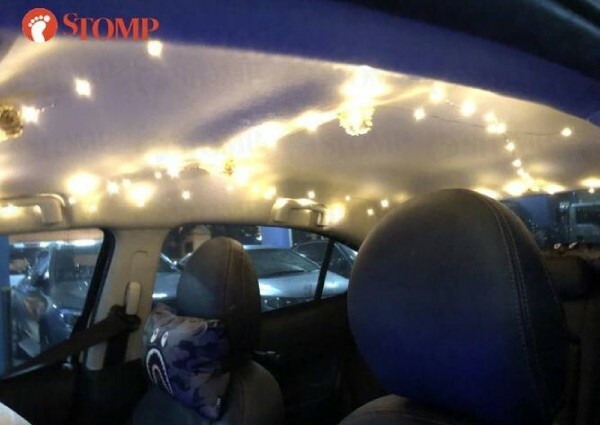 “The moment he turned on the lights, he really put us in a festive mood, especially now that festive occasions tend to heat up slow in Singapore. “There were also roses adorned along the fairy lights and Mr Clarence said he spent two hours to get everything done up. “He also told us that he was going to buy a small little lantern as an add-on for Chinese New Year. Don’t we all want to book his Grab car now? Something as simple as going the extra mile to decorate your car, really can make someone’s day.